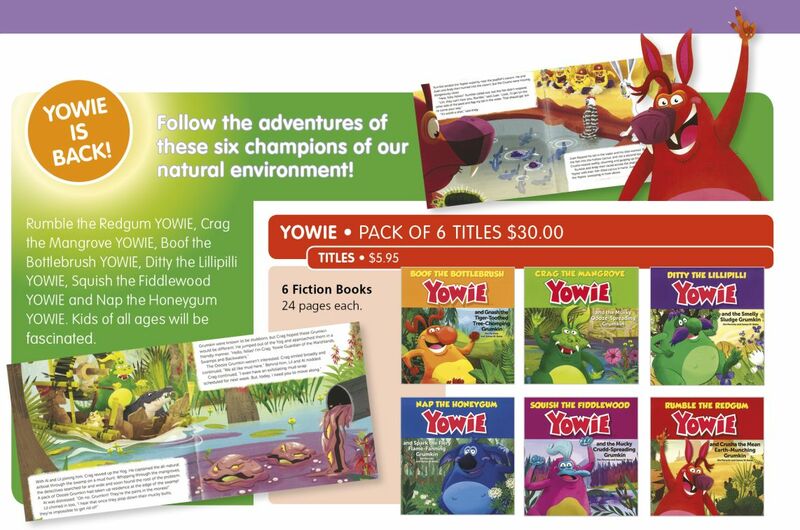 Purchase a set of 6 Yowie titles, presented in a handy carry-case, for just $19.95 (normally $30.00)! Perfect for gifts and collectors! 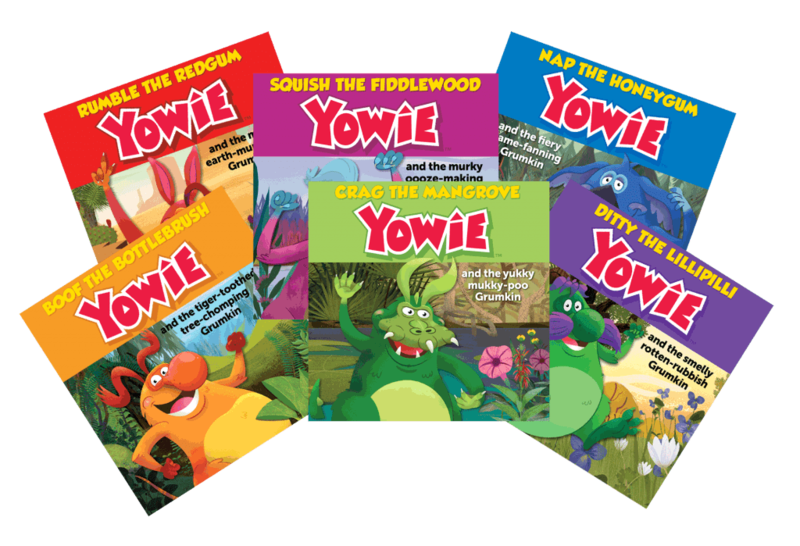 The Yowie are here to teach children of all ages about the wonders of our natural heritage, remind us of its value, and teach us how to help save the natural world while having loads of fun! 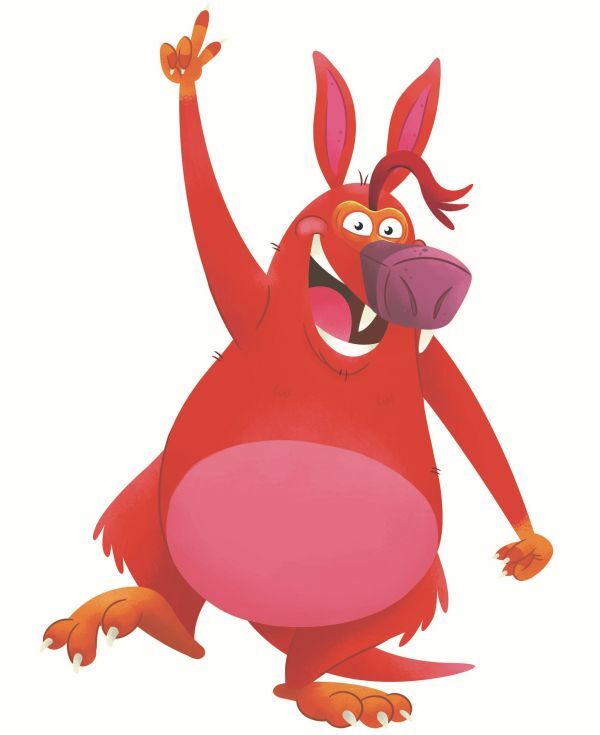 Learn more about the Yowie and their mission to raise eco-consciousness through play at YowieWorld.com. 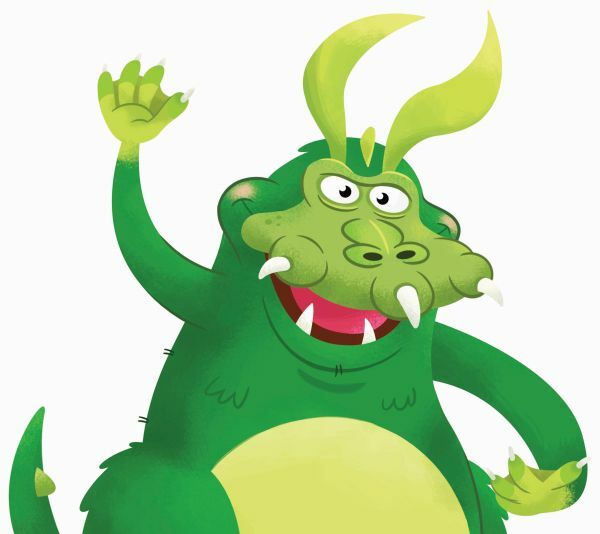 A menacing roar announces the attack of the mean earth-munching Crusha Grumkin. 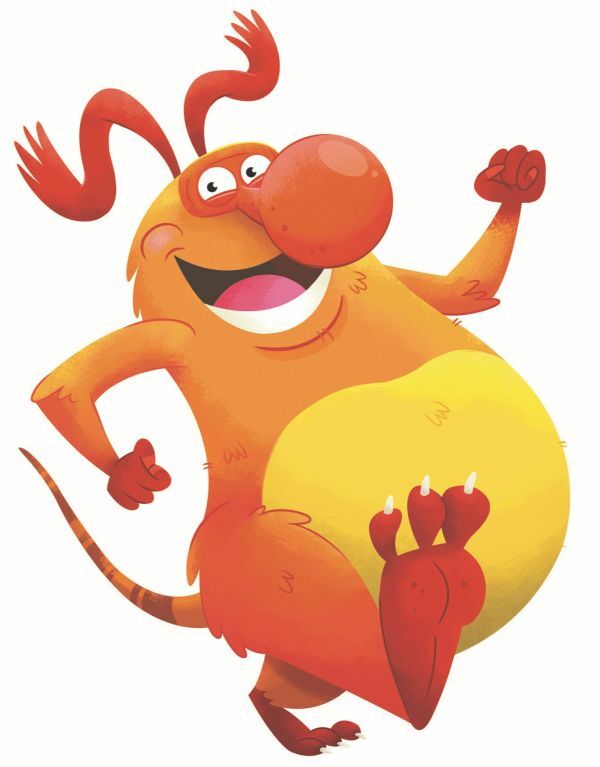 If Rumble the Yowie cannot stop Crusha, the natural desert habitat with its animals will be totally destroyed. Desperately, Rumble and friends plan to trick the Gumkin. It's Crusha versus Rumble and the desert animals. Who will be the winner? 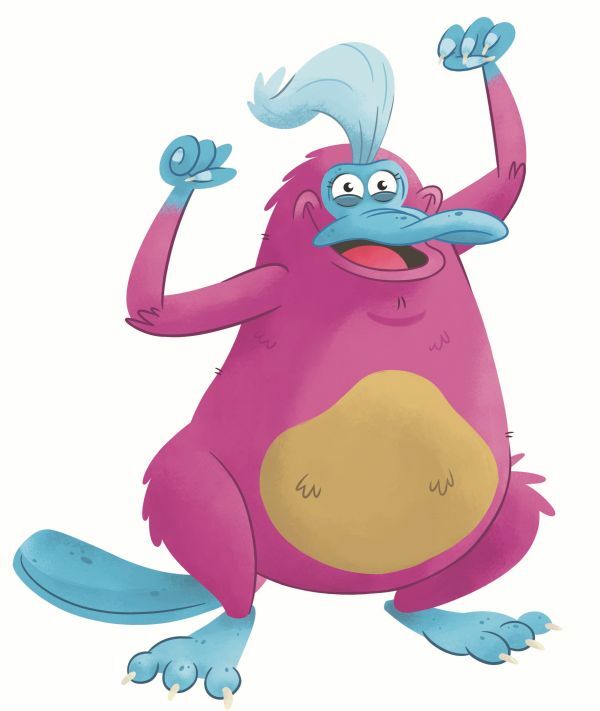 The murky Oooze Grumkin invades the pristine waterways, turning them into mud. Crag the Yowie must find a way to get rid of this evil menace before the habitat is destroyed. Crag and his animal friends invent a plan to trick the Grumkin. But will it work? 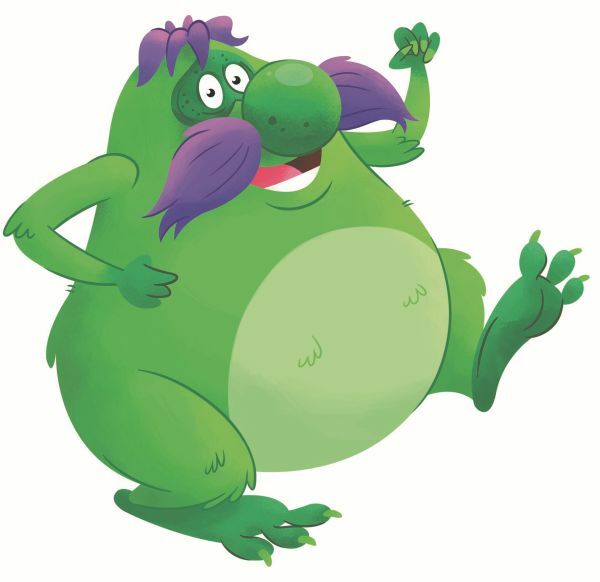 The smelly Sludge Grumkin leave trash all over Ditty's tidy habitat. The Yowie and friends try to convince the Sludge to leave, but when that fails to work, it looks as if they will all be buried under foul-smelling trash. Nature intervenes and soon friend and foe fight to survive. But will they? The fiery flame-fanning Spark Grumkin threatens to engulf the forest in fire. 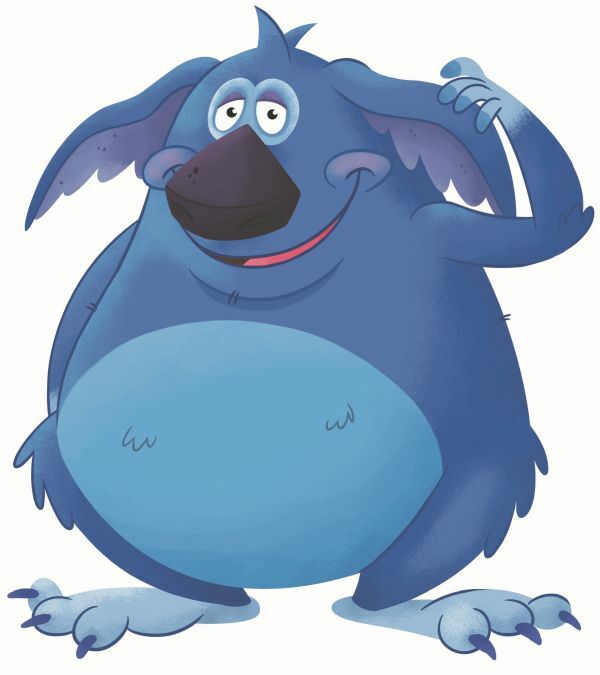 It is up to Nap, the wisest of all the Yowie, to stop them. Can Nap, with the help of the woodland friends, stop the Spark? Or will the habitat become a smoldering wasteland? It takes a lot to upset the peace-loving Boof the Yowie, but when the tiger-toothed tree-chomping Gnash Grumkin arrives and endangers Boof's beloved rainforest, the Yowie has to take a stand. Friendly attempts to get the Grumkin to leave fail, so Boof enlists the rainforest friends to devise a sneaky plan. Can they trick the Grumkin or will they risk losing not only their habitat, but also their lives? The oily, sticky Crudd Grumkin slink into the waterways, threatening to kill everybody in its path. Squish the Yowie must fight to save the natural habitat with the help of her animal friends. They invent a clever trap, but when it all goes wrong, Squish must make a decision. Who will survive, Squish or the Crudd?